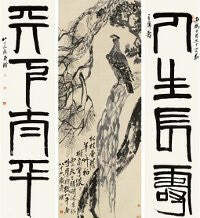 A Qi Baishi artwork set a new record for a contemporary Chinese painting in Beijing on Monday. The 1940's depiction of an eagle on a pine tree achieved $65.5m at China Guardian's spring sale and is further evidence of the soaring popularity for art among Chinese investors. Qi Baishi produced the piece for the then-leader of China, Chiang Kai-shek. "His paintings have not only affected numerous people inside China, but have won global respect," Guo Tong of China Guardian told the BBC. An 11th century scroll produced by calligrapher Huang Tingjian remains the most expensive piece of art ever auctioned in China. It achieved $67m in 2009.